Description: Colt O1990CM 1911 .45acp, 5”, Custom Shop Special Combat Government COMPETITION, Black Carbon Steel slide and frame, semi auto pistol – NEW in BOX. SUPER HARD TO FIND!!! Ready for competition or self defense, the Colt Special Combat Government Competition 1911 Pistol has a full list of high quality features. The 5 inch National Match barrel of the Colt Special Combat Government Competition 1911 Pistol is equipped with a front Heinie dovetail and rear Bomar adjustable sight to assist with pinpoint accuracy. The carbon steel slide and frame of the Colt Special Combat Government Competition 1911 Pistol has a blue-black finish and features G10 silver/black grips with upswept ambidextrous safeties and a single action three hole skeltonized aluminum match trigger. 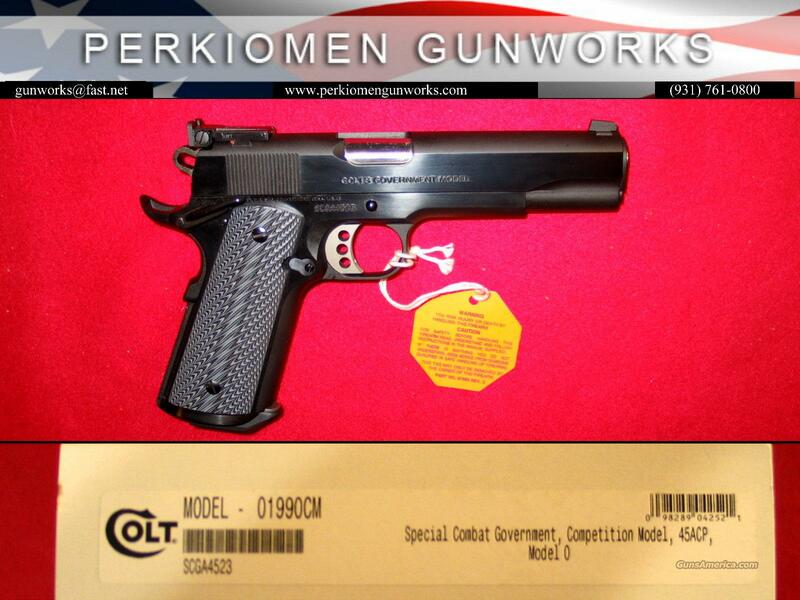 The Colt Special Combat Government Competition 1911 Pistol even comes with two magazines that are able to hold 8 rounds. If you are looking for a handgun that is stable and comfortable to shoot, look no further than the Colt Special Combat Government Competition 1911 Pistol. Specifications: Colt Special Combat Government Competition 1911 Pistol, Manufacturer Number: O1990CM, .45 ACP, single action, 5” bbl, 2-8+1 Magazines With Bumpers, Test target, lock, Custom Shop box. Other Custom Shop Features: Enhanced Tolerances, Polished Feed Ramp, Flared Ejection Port, Throated Barrel, Steel Checkered Mainspring Housing, Extended Magazine Well, Adjustable Skeltonized Aluminum 3 Hole match trigger, Enhanced With Elongated Slot hammer. * NOTE: Photos are of sample gun. +INSURED S&H of $40.00 to your local FFL for transfer. **Note: This gun (and all our guns) is IN STOCK; our price is fair and firm. We know it’s not the lowest price BUT this is the gun you are buying – we don’t give you a discount lower price and then put it on order!! !